Ballarat Wildlife Park has commenced work on its new million-dollar Global Conservation Precinct, due to be complete before Christmas. In the centre of the precinct will be Ballarat’s own Tiger Sanctuary home to the Sumatran Tiger. Sumatran Tigers (Panthera tigris sondaica) from the Indonesian island of Sumatra face many challenges to their survival, it is estimated that only between 500-600 Sumatran tigers remain in the wild, and the actual number may be as low as 400. The Sumatran Tiger population is dropping rapidly due to clearing of their natural habitat for farming and palm oil plantations, as well as poaching of tigers for markets and medicine trade. The Sumatran Tiger is the only surviving tiger population in the Sunda Islands, where the Bali and Javan Tigers are now extinct. The Sumatran Tigers soon to arrive at the Ballarat Wildlife Park were born in captivity and hand-raised at Australia Zoo. The tigers are part of a Global Species Management Plan and will be ambassadors for helping their wild cousins survive in the wild through education programs and promotion of conservation initiatives. Leading the project is Operations Manager & Curator, Robbie Doyle. Mr Doyle joined Ballarat Wildlife Park in early-2018 and brings with him 15 years’ experience of hand-raising and working alongside tigers in captivity at world-class facilities including Dreamworld’s Tiger Island and Australia Zoo’s Tiger Temple. Mr Doyle and the Parker family are creating the new conservation display to ensure a stress-free environment for its new inhabitants, as well as training staff to provide a positive quality of life that every animal living in captivity deserves. The enclosure will include state-of-the-art security to ensure the tigers and the community are kept safe. “This is a major coup for tourism in Ballarat, there’s not a lot of places where one can see these amazing creatures” Mr Doyle said. Ballarat Wildlife Park is supporting the tiger conservation efforts via the Tiger Protection Conservation Unit (TPCU). The TPCU are known for disabling snares, following leads, solving tiger-human conflict and providing evidence for legal proceedings. Their continual work is contributing to saving the Sumatran tiger species. The new Global Conservation Precinct is being built with the assistance of the Government’s Tourism Demand Driver Infrastructure program. Ballarat Wildlife Park is an interactive wildlife park set on 32 acres of parkland in the regional Victorian city of Ballarat. 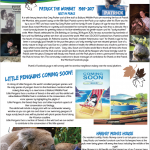 A family-owned-and-operated business, Ballarat Wildlife Park has continually grown and evolved over it’s 33 years of operation. Opened by Greg Parker in 1985, Greg’s vision for the Park is to enable visitors to experience animals with sight, smell, sound, and touch. The park has a strong focus on conservation and is involved in a number of National and International research and breeding programs including for the Tasmanian Devil and the Tree Kangaroo. Today the Park offers a wide variety of experiences with animals: visitors can hand-feed kangaroos, pat a koala and see Tasmanian devils being fed. Animal keepers host daily presentations with dingoes, reptiles and penguins. Animal encounters are available giving visitors the rare opportunity to do something really special from being photographed with a snake wrapped over their shoulders to cuddling a wombat. An impressive reptile centre displays snakes, lizards and frogs and adjoins the Crocodile Billabong & Conservation Centre with a glass-fronted pool enclosure, home to the five-metre-long crocodile named Crunch. For many visitors to Ballarat Wildlife Park, it is the first time they have been up-close to many of these native animals; to touch a snake, to see the inside of a crocodile’s mouth up-close, to feel the softness of koala fur, have their hand held by a kangaroo. It is this connection that the Park hopes will stay with visitors emotionally and coupled with the educational presentations, give them an increased understanding of the significance these animals have and the importance of protecting them for future generations.